In this VMware article, let us discuss the fundamental concepts of virtualization and review the VMware virtualization implementation options. Following are few reasons why you might want to think about virtualization for your environment. Run multiple operation systems on one server. For example, instead of having development-server and QA-server, you can run both development and QA on a single server. You can have multiple flavours of OS on one server. For example, you can run 2 Linux OS, 1 Windows OS on a single server. Multiple OS running on the server shares the hardware resources among them. For example, CPU, RAM, network devices are shared among development-server and QA-server running on the same hardware. High availability and business continuity. If VMware is implemented properly, you can migrate a virtual machine from one server to another server quickly without any downtime. This reduces the operational cost and power consumption. For example, instead of buying and running two servers, you will be using only one server and run both development and QA on it. On a high level, there are two ways for you to get started on the virtualization using VMware products. Both of these are available for free from VMware. 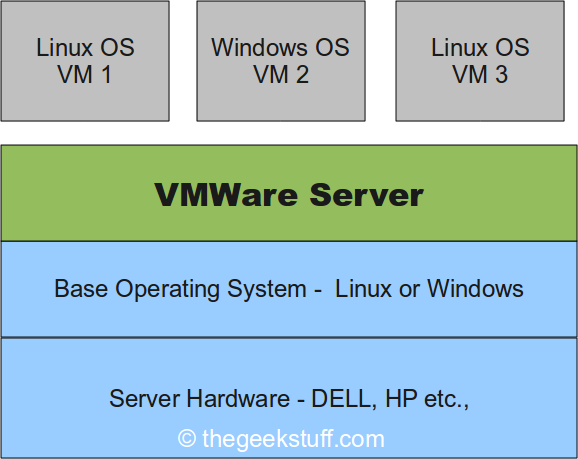 VMware Server runs on top of an existing host operating system (either Linux or Windows). This is a good option to get started, as you can use any of the existing hardware along with it’s OS. VMware server also support 64-bit host and guest operating system. You also get VMware Infrastructure web access management interface and Virtual Machine console. 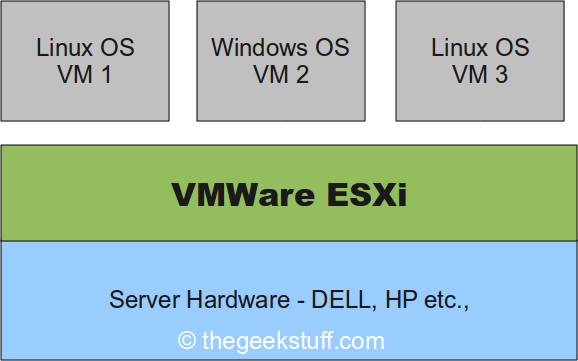 VMware ESXi is based on the hypervisor architecture. VMware ESXi runs directly on the hardware without the need of any host operating system, which makes is extremely effective in terms of performance. This is the best option to implement VMware for production usage. Memory compression, over commitment and deduplication. built-in high available with NIC teaming and HBA multipathing. Highly compatible with various servers hardware, storage and OS. Advanced security with VMSafe, VMKernel protection and encryption.